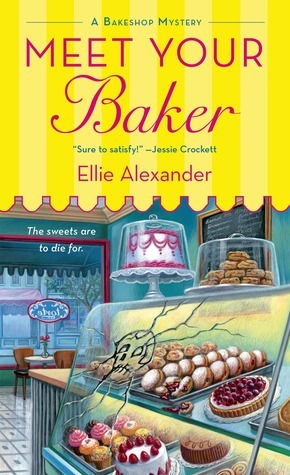 Meet You Baker by Ellie Alexander is a great debut in a fun, entertaining cozy mystery series. This book follows Juliet Capshaw, a heartbroken cruise ship employee, who moves back home to help her mom run the family bakery. Once there, she becomes entrenched in the small-town politics of the community’s most theatrical as one board member of the local Shakespeare festival is found dead after eating at their bakery. I love a good cozy mystery series. The mystery genre is my favorite, and I love trying to solve the mystery along with the protagonist. However, mystery novels can tend to be pretty formulaic. The difference between a mediocre mystery series and a great mystery series is the character development. Just because the plot has formulaic elements, this doesn’t mean the characters all have to be stereotypes that we’ve all read over and over again. This bakeshop mystery series is an example of a mystery series that has been handled correctly! The protagonist Juliet does have some qualities of most mystery heroines (unlucky in love, living in a small town, trying to find herself) but she had enough interesting quirks and qualities to set her apart from the other standard heroines. She has more depth and backstory than most, and this really enhances the novel and will hopefully continue through the whole series. Cozy mystery lovers are sure to love this one, but I also think this is a good starter cozy mystery for someone who wants to give the genre a try but who has been worried that they might be too fluffy or formulaic. This is one with a wider audience appeal, and it contains a wonderfully diverse cast of distinct characters who came alive on the page.